As I walked, I was seeing bodies being cremated on the river front (known as the burning ghats) while hundreds of people were doing their daily bathing and laundry in the same river at the same time. Being cremated here is every Hindu’s ultimate wish. According to Hindu belief, the Ganges bridges the mortal and spiritual realms. 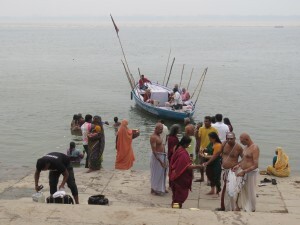 To have one’s ashes released into the Ganges enables their souls to travel to the afterlife and be reborn to a better life. 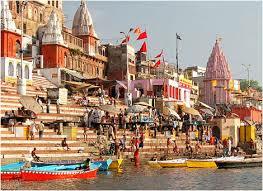 And if you actually die in Varanasi, one receives moksha– liberation from the cycles of life and death. Everyone wants some of the holy water in the Ganges. The hawkers sell plastic containers so you can take some home. 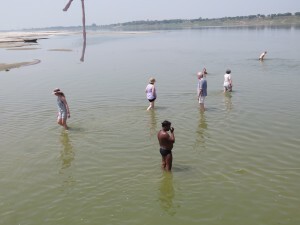 Throngs of pilgrims flock here to take a dip which is believed to absolve one from all sins. So, of course, some of the pilgrims in our group had to wash away some of their transgressions as well. We went up river a bit since the water around Varanasi is so trashy and polluted. Michael didn’t go into because of the gash on his leg and I didn’t because I was too scared. I don’t care how holy it is, it is the filthiest water I’ve ever seen. On the river bank and in the temples, people of many different spiritual sects are participating in a wide diversity of spiritual practices – preaching, praying, singing, chanting, and making offerings. There were pujas to the rising sun and lively sunset worship services. There are holy men everywhere, just hanging out, all day long. It is believed that whatever act of generosity is given in Varanasi reaps benefits thousands times more than anywhere else. And beggars seem to know this. There were hoards of very poor children and crippled people begging incessantly. The most popular item being sold was the offering cups with a candle that could be lit and sent down the holy river. 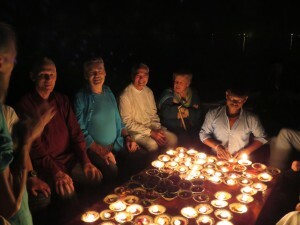 After lighting one for a couple of girlfriends and one for my mother, we took a boat out to the middle of the Ganges and lit seventy offerings for our teacher, Atum, as it was his birthday. We made wishes for his health and expressed gratitude for his life knowing he would be doubly blessed here. 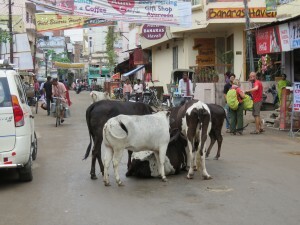 Cows, goats, monkeys, skinny dogs, even more cows, along with bicycle and auto tuk tuks rule the streets and the traffic . The real danger in the streets of Varanasi are aninals defecating at will, and often, anywhere and everywhere. I was told that to step in a pile of cow poop was considered to bring good luck. I don’t think so. Every five feet, interesting and pungent foods were being cooked and sold on the sidewalks to the masses, along with every possible trinket imaginable. There was a constant hawking of “Please come take a look”. We did our fair share of contributing to the economy. We bought trinkets, statues, and prayer beads, but my favorite purchase was a simple t-shirt. Hindus have thousands of gods and goddesses that believers pray to for specific needs and requests. One prays to Ganesh, the elephant headed god, to remove all obstacles in their life. One prays to Lakshmi for wealth, wisdom, and fertility or Shiva for immortality and renewal. 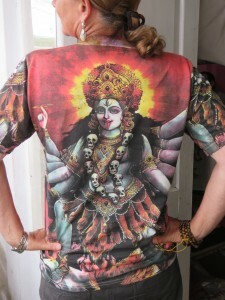 However, for empowerment, and in particular, feminine empowerment, one prays to the goddess, Kali. Kali is a fierce warrior. She helps us to battle our inner and outer unworthiness and to learn to stand up and say “No” to all that harms us. I intend to take Kali back to San Luis Obispo for the women I work with in the Women’s Shelter Program. One of the highlights of our Varanasi time for me was a visit to the Kiran Society – a small, self-sustaining village that helps about 50 disabled children and 50 poor children. The families are involved and the children are taught educational and vocational skills that enable them to join the mainstream. Those with disabilities are fitted with the proper medical devices that give them the ability to be an active part of the community. The children were enthusiastic and proud of what they had accomplished. 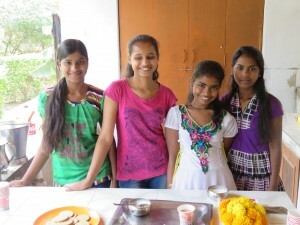 We first felt this joy at The Hope Project in New Delhi and now here. So many people working to make life better for those with so little. We rarely hear about these people in the news but there are many people doing this work and it gives me great hope. Varanasi is a very challenging place for most us from the industrial west. It is such a contrast to what we know and live. But as we travel the world, it becomes clear that Varanasi-like places are the norm for billions of people and our life, the life of the privileged, is the unusual. I leave Varanasi with incredible gratitude for being born into the lifestyle and opportunity of the US and I leave in awe of how so many people in the world not only survive with so little, but create a life with some joy and laughter. Four days in Varanasi was intoxicating. It still feels a bit unreal to me. This is the most colorful, alive, poor, sacred, pushy, dirty, chaotic, and vibrant place I’ve ever seen. I’m kind of thankful it’s time to leave but I’m also so glad I came. We boarded another overnight train to return to New Delhi. We arrived over five hours late after stopping at every possible crossing. It was quite maddening. We decided this was an opportunity to practice our Buddha nature. After a night in Delhi, we have loaded a bus to travel to Agra – the home of the Taj Mahal. Next time we will report on the most photographed building in the world. This entry was posted on Thursday, April 2nd, 2015 and is filed under Bali, Buddhism, Hinduism, India, Journey, New Delhi, Spiritual Journey, Travel blog, Uncategorized. Kathy, Mike – your descriptions are colorful and vivid. India is a country of contrast with so much diversity. I can’t wait for your take on the Taj Mahal and its history. Kathy I can picture you in awe and bewilderment. I was thinking you would be brave and swim in the Ganges at Varanasi to achieve Moksha. 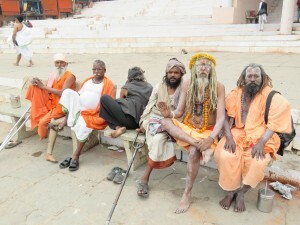 I’ve heard many stories from awestruck visitors to Varanasi. Well played to save this for later in the trip after you’ve become acclimated to the bizarreness that is India. Describe the cuisine…what are the farmers growing? Kathy, WOW want a journey! I’m still thinking of the quote on Gandhi’s grave, “Oh God”. It sent chills through me. The rest, I’ll have to live through your words. 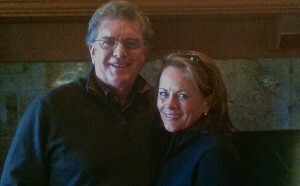 I agree with Pat and Leyla…….sounds like you are eating well so would love to hear about some of the meals. Sometimes you just have to use your own common sense. If the water is filthy, you just have to find your holiness somewhere else! Loved the pictures, your thoughts and the description of your experiences. Love how you relate your experiences! Seems like it truly is a journey from which you will evolve. Starting my own journey next week to Turkey and beyond! will try to remember some of your spiritual words when I see the unexpected. All I can say is thank you, Kathy and Michael. I’m re-living through you my parents visit to India last century. It took my father 15 years to convince my mother to go to India with him. I have their slides. Very Nice City Varanasi !! !